A picture showing the faint tail of the celestial body 596 Scheila, which was once thought to be an asteroid. Researchers now think it may be a dormant comet coming back to life. A huge asteroid discovered more than 100 years ago may not be an asteroid at all, but a dormant comet that is just now coming back to life, according to new observations. The asteroid-turned-comet discovery was somewhat serendipitous. On the night of Dec. 11, astronomer Steve Larson, a scientist with the Catalina Sky Survey in Tucson, Ariz., was searching for potentially hazardous asteroids when he came across an object with a bright core and a faint tail. Four images taken in a span of 30 minutes revealed the object was moving relative to the background stars, researchers said. "Its brightness of a total magnitude of 13.4 visual, which is about 900 times fainter than the faintest star you can see in a clear, dark sky, led me to suspect that it was a known comet, but I checked the comet database and got nothing," Larson said in a statement. Further investigation revealed that the object was actually 596 Scheila, which astronomers first discovered in 1906. Scheila tumbles through space alongside thousands of similar objects in the main asteroid belt, but orbits slightly out of the ecliptic plane in which most planets and asteroids travel, researchers said. Previous studies of 596 Scheila's color have suggested that it is composed of primitive carbonaceous material left over from the formation of the solar system and might be an extinct or dormant comet. These bodies have already ejected most of their volatile ices and therefore have lost their cometary tails. Dormant comets retain some subsurface volatiles and may start outgassing once again as they near the sun. "Scheila, along with several other bodies in the past few years, have created a new class of solar system objects: main-belt comets," Bill Cooke, of NASA's Meteoroid Environment Office at Marshall Space Flight Center, wrote in a blog post after Larson's find. "These bodies are an anomaly and a mystery since an object this close to the sun should have had its ices vaporized away." 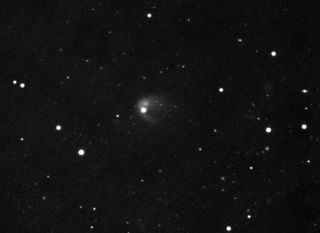 After Larson reported his discovery, many other astronomers pointed their telescopes at 596 Scheila to determine if its tail consists of ice and gases — as would be expected for a comet — or if it is merely dust left behind from a collision with another asteroid. Preliminary findings of the outburst show that 596 Scheila's tail is composed of dust, but more observations will be needed to understand just what is happening with the object, researchers said.